With the growing trend to develop deep and ultra-deep fields, the offshore oil and gas industry is increasingly demanding tools for cost-effective, reliable exploitation and maintenance of subsea equipment. Over the past decades, ROVs and ROTs have proven to be very efficient and versatile. These vehicles have become more sophisticated; however, they still require a great amount of electrical energy as well as constant, real-time supervision/control by highly trained operators. Support vessels are therefore clearly the primary part of operating expenditures (OPEX) for inspection, maintenance and repair (IMR) of deepwater field, and the only way to suppress them is to remove the intervention vehicle’s umbilical, that is to turn ROVs into Intervention-AUVs (I-AUV). 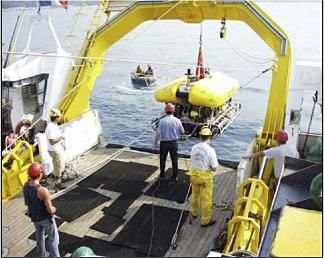 During the late 90’s, because several manufacturers occupied the Survey AUV niche, Cybernetix chose to invest in the I-AUV segment. In co-operation with strategic partners, the company set-up and undertook two major R&D programmes. The first, SWIMMER – an AUV-shuttle designed to deliver a conventional work-ROV to a subsea docking station – connected to the surface production facilities through a preinstalled power/control umbilical. This Hybrid Underwater Vehicle (HUV) concept is mobilised permanently on a FPSO or platform and the associated OPEX are extremely low. It allows the same operation as that of a traditional work-ROV, but eliminates the need for a support vessel because its extended range of operation allows the system to be launched and recovered from the surface production facilities. Although very promising, the HUV concept requires a dedicated docking structure and umbilical. To overcome this and offer the possibility to perform simple IMR operations on standard subsea equipment without modification, Cybernetix and its partners started the Autonomous Light Intervention Vehicle (ALIVE) project in 2001, with the key objective of developing a true I-AUV. Unlike torpedo-shaped survey AUVs, the ALIVE open-frame structure, with buoyancy located on top and heavy components at the bottom, gives high natural pitch and roll stability. The 4-metre long (with grabbers retracted), 2.2-metre wide, 1.6-metre high (excluding antennas) ALIVE weighs 3,500 kilograms and is slightly buoyant in sea water. The ALIVE battery system is composed of 2 different packs: 40 kWh/240 VDC for propulsion and 4 kWh/24 VDC for instruments and computers. AUVs require efficient propulsion system to save energy and to avoid generating acoustic noise that could disrupt acoustic communications. ALIVE’s thrusters are the result of a development process that began with the SWIMMER project. ALIVE has three different communication links. Ethernet via a 100-metre debug umbilical is used for mission preparation and data downloading. A 9.6-kbps, half-duplex modem for radio communications provides a 5-kilometre extended range at sea, even in harsh conditions. Underwater acoustic modems offer a 100-bps, half-duplex, high-reliability channel for control and monitoring, and an 8-kbps channel to upload video and sonar images. Nominal acoustic range is 3,000 metres, and the system is designed to enable links even in horizontal channels and in noisy environment both at the surface and subsea. The ALIVE navigates via an original hybrid system based on dead-reckoning as well as speed vector/altitude/depth. Corrections are based on GPS during surface navigation, and when underwater, corrections are provided by GIB, sometimes referred to as “underwater GPS”. An eight-step operational scenario has been developed according to the expected technical performances of the system. Mobilisation/Launching: ALIVE is a light-weight, compact vehicle that can be easily mobilised on any vessel of opportunity. Battery capacity allows for 10 kilometres total trip distance, and the vehicle is taken above the intervention location and launched using simple crane and appropriate launch and recovery cage. Dive Start: The vehicle is piloted using joysticks to a safe location for initiating diving procedure. Once all systems verified, diving is started by the operator. When the vehicle is submerged, radio communication is lost and an acoustic communication link is quickly established. Transit: The vehicle is programmed to reach a predefined safe positioning zone, located 20 to 30 metres in front of the target. This transit phase uses a navigation process based on hybridisation of dead-reckoning and LBL position fixes (given by GIB system). This allows a +/- 5-metre positioning accuracy that is sufficient for the next phase. When on location with the correct heading, a Dynamic Positioning process is activated. Target Identification: ALIVE uses its sonar system (SDS) to perform target identification. If the position and heading are correct, the target’s signature is detected by the sonar and uploaded to the surface station. Approach: Once the target is located, a motion planner is activated and slowly brings the vehicle to a predefined position allowing mechanical docking with grabbers, under constant supervision of SDS, which periodically recomputes target’s relative position. 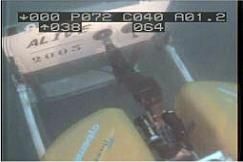 The fine positioning of the vehicle in front of the target (ROV-panel) is given by a video-based 3D pose estimation (VDS) when the target distance is below 2 metres. Docking: When the vehicle is well positioned in front of the ROV-panel, the operator initiates the mechanical docking phase. This involves the Tele-Manipulation (TM) subsystem, which manages hydraulic grabbers and a 7-function manipulator arm. Grabbers are deployed and the firm closing of specific claws ensures correct final alignment on standard docking bars. Tele-Manipulation: After docking, the surface TM supervision station is updated with the final position of the vehicle on the ROV-panel. A virtual 3D scene is then reconstructed using CAD models of the vehicle and of the target. This scene is constantly updated using monitoring data. Recovery: After completion of the intervention tasks, the process described above is reversed: manipulator is parked, grabbers are released and the vehicle is piloted back to the Safe Positioning Zone, from where transit back to surface can be safely started. An ALIVE prototype was fully designed, manufactured and integrated between February 2002 and May 2003, during which time stand-alone tests of every subsystem were successfully completed. In July 2003, connection and collaborative tests of the subsystems involved in target ID, approach, and docking were carried out in dock. In August 2003, a 4-day sea trial was organised on board Ifremer’s R/V Europe. The objective was to test the vehicle in real AUV conditions, including test of the navigation process, the acoustic modem’s behaviour in open waters, the vehicle’s hydrodynamic behaviour, as well as for checking emergency procedures and launch and recovery procedure training. All these tests went well, leading to implementation of some improvements during the mission. In September 2003, the system underwent another series of dock/pool tests. 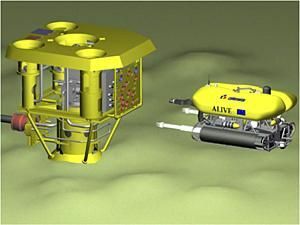 In October 2003, ten days of operational tests were performed with the objective of performing full-scale operations on a ROV-panel mock-up in fully automatic mode. The ALIVE system was mobilised on R/V Europe, and a sheltered, wind-free test site was selected of 80-metre depth, which was compatible the vessel’s mooring capabilities, with a flat sand/silt seabed for correct installation of the ROV panel mock-up. On the first day, the ROV panel installation and GIB buoy mooring were tested. The successful execution of tele-manipulation tasks on the ROV panel, operating in full-autonomous mode was the ultimate objective for this series of validation tests at sea. The tests were performed under severe sea and wind conditions that allowed only three full days of operations. Despite of this, the system performed extremely well. Software simulation also proved to be extremely efficient, which allowed the crew to be trained prior to final sea trials, allowing efficient reaction in unexpected situations. The ALIVE system has shown impressive reliability, proving the skills of the development team and the huge amount of experience acquired by the partners in the complex field of I-AUVs. All the technical choices for global architecture and subsystem development have proven to be particularly relevant. Commercially, following the successful completion of the SWIMMER R&D phase and immediate start of ALIVE project, the offshore oil and gas operators’ attention has remained focussed on I-AUVs and the potential savings this technology may bring. What was a curiosity four to five years ago has gradually become of real commercial interest. ALIVE’s proven capability to provide quick, cost-effective interventions on existing, unmodified subsea equipment is something major operators are following very closely. The author also wishes to thank the Freesub network team (a European Commission funded Thematic Network, managed by Cybernetix).